To get from Victoria to South Australia, many people choose the Great Ocean Road. Others follow the Murray from its source to the sea. 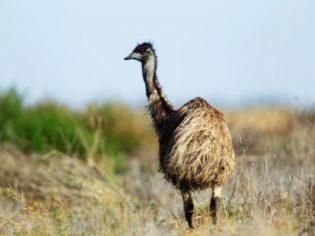 But the inland route along the often-overlooked B12 highway is a drive worth taking for its historic country towns, grazing land, pink-hued lakes, salt dunes and wild mallee scrub. Lanky eucalypts loom above the waters of Murray flood plains as the sun lowers itself behind them, leaving romantic reflections on the still waters. Magpies and kookaburras sing their goodnights. We are in Tooleybuc, NSW, at the start of a good old Aussie road trip. We are driving the length of the Mallee Highway from east to west over the next few days – well, nearly all of it. We join the highway at Tooleybuc as we make our way from Melbourne to Adelaide, hoping for a scenic alternative to the usual Dukes Highway. The picturesque Mallee Highway (aka the B12) is roughly 430km long and stretches from Balranald in NSW across the northern farmland of Victoria, before ending just south of Tailem Bend, South Australia. After spending the night huddled next to the fireplace in the cosy Tooleybuc Hotel, we get up early, eager to see what the highway has in store. As we cross the Murray River over the rickety Tooleybuc bridge and into Victoria, the slowly lifting mist lets through a few rays of sun, just enough to warm our backs as we head west. About five minutes down the road in Piangil, we come across 25-year veteran volunteer fireman Kim McFarlane and his dog Gabby. Up early on a Sunday morning, as always, he goes through the weekly safety procedures at the CFA fire station with his colleagues. There is no sleeping in on a Sunday morning for anyone else in Piangil either, as part of the procedure involves testing the deafening CFA alarm system. It is the little things that catch our eye along this stretch of the highway up to Ouyen, where we plan to spend the night. Good rains have brought an abundance of wild melons. Bright green and yellow, they litter the countryside along the road, creating a striking contrast against the brown earthy tones of the surrounding farmland. We find miniature wagons for sale in Manangatang, homemade mailboxes made from milk cans and scrap metal, as well as little help-yourself stalls where you can buy butternut pumpkins in exchange for leaving change. Ouyen, Victoria’s “Town of Choice”, is the commercial and transport centre for the surrounding grain farm region. The railway station dominates the town, but an equally marvellous feature is the Hotel Victoria. Built in 1919, it has all the classic iconic hotel features. Apart from the power lines running across the street, it would be a perfect setting for a period outback movie, with horses instead of cars parked out the front. The hotel has a grand staircase to the second floor, high ceilings, creaky old hallways and a magnificent front bar that stretches almost the length of the building. The atmosphere and hearty pub menu makes dinner here a must. It has one shortcoming: built in the old tradition, guests in all but one of the 29 rooms have to share bathroom facilities. As we head west from Ouyen, we start to see more and more mallee trees, the eucalypts with characteristic multiple spindly stems that gave the area its name. In some areas there is only a thin lining of mallee next to the highway as we pass through farmland. However, you do not have to travel far off the main road to get into the thick scrub, as the area is flanked by national parks. To the north is Murray-Sunset National Park and to the south are Wyperfield and Big Desert. The textures and colours of the natural scrub are spectacular as the afternoon sun casts patchy shadows, creating a scene of heightened contrasts that starts to play tricks on our eyes. We continue just out of Underbool to the sign, which shows us it’s only 13km to Pink Lakes. They’re part of the Murray-Sunset National Park and on entering, to our delight, we find ourselves in the middle of an unexpected Australian safari. We spot emus first, then three eastern grey kangaroos suddenly hop out of the scrub, halting abruptly to look us over before bounding off, uninterested. We take it slow on the good gravel road and keep our eyes open for the elusive mallee fowl, an endangered species that nests in the scrub, but we are not lucky enough to spot one. An information board at Lake Hardy tells us that these salt lakes get their marshmallow-pink glow from algae in the water. Further on at Lake Becking, the kid in me is tempted to run up and down the steep salt “dunes”, relics of the salt mining that occurred here from 1916 until 1975. The refreshingly understated, yet typically Australian, landscape and wildlife are leaving their mark on us. We stay to watch the sunset over the mallee scrub before heading on to Murrayville, where the dinner menu at the Murrayville Hotel boasts… “Mallee Fowl”! Fortunately we soon discover that the attention-grabbing menu item is merely a cheekily named chicken dish, but we order it anyway, then turn our attention to the correct local terminology for ordering a beer – after all, having started our journey in NSW, we’re now in Victoria and only 20km from the SA border. A South Australian schooner is a different size from that in NSW. A pint differs between Victoria and South Australia, and an imperial pint is different again. Then there are pots, glasses and mugs with a handle. We spend the night in Murrayville, and the next morning continue west into South Australia. As we enter Pinnaroo, the towering grain silos on the outskirts of town remind us again that this is farm country. On this windy day we spot a flock of galahs clinging to an aerial tower above the police station. Lined up in a row, they drop their heads to brace against the oncoming wind. Then something spooks them and they take flight in a pink cloud of loud confusion before returning to the tower. We buy some country pies from the bakery and head west once more. The rest of the drive to Tailem Bend is scenic through cultivated landscape. The farmlands are a patchwork quilt of yellow and green canola fields, and wildflowers are scattered along the railway line that runs parallel to the road. As a thunderstorm rolls through the countryside it leaves a bright rainbow behind. The sun finally reappears as we reach the end of the Mallee Highway at the junction with the Dukes Highway. There we turn north-west, crossing the Murray River which has looped round to join us again, for the final hour’s drive to Adelaide. Love the sound of this drive? You should check out our list of iconic Australian road trips.